Many people when first trying to calculate distances between two longitude / latitude pairs ask if Pythagorean theorem works as an appropriate distance function. Most often people answer "no, the Pythagorean theorem only works on a 2D Euclidean plane." Rarely, however, do people mention the effect of scale and location on the sphere on how inaccurate the Pythagorean theorem is. The basic idea being at very small scales, the surface of a sphere looks very much like a plane. At very large scales, it distances along the surface are more curved and therefore the difference between the incorrect Pythagorean Theorem and the correct Haversine Formula is greater. Does anyone know a formula or rule of thumb that tells you the difference between the two distance measures based on the scale of the distance you are trying to measure? in letting people who are looking for more "rough" distances know when Pythagoras actually will serve their purposes. Using the Pythagorean formula on positions given in latitude and longitude makes as little sense as, say, computing the area of a circle using the formula for a square: although it produces a number, there is no reason to suppose it ought to work. Distances along lines of longitude will be reasonably accurate. Distances along the Equator will be reasonably accurate. All other distances will be erroneous, in rough proportion to the differences in latitude and longitude. The error depends on the start and end point of the distance calculations. However, because both the sphere and ellipsoid have a circular symmetry around the axis, the error depends only on the difference of the longitudes, so to study this error we might as well take the point of origin to be at the Prime Meridian. 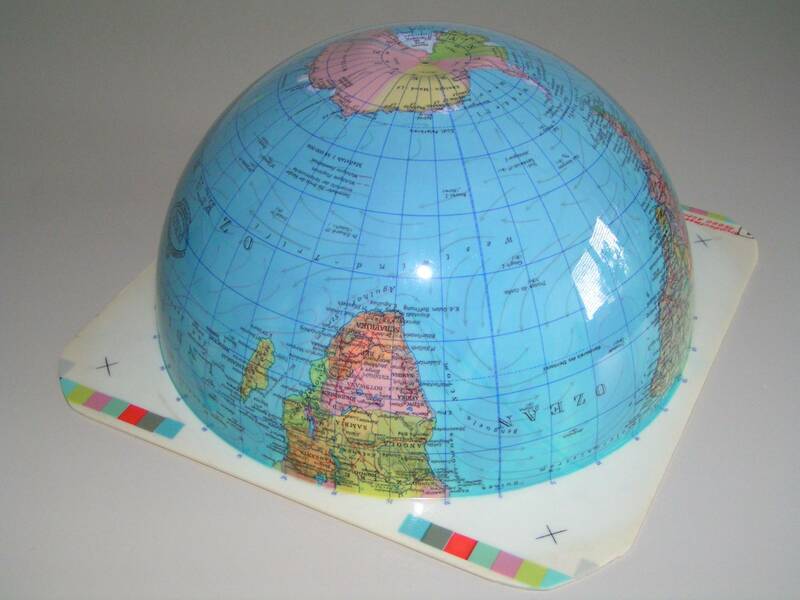 Because both the sphere and ellipsoid are symmetric under a north-south reflection, we only need to study points of origin in the southern hemisphere. For any such point we may draw a contour map of the relative error, equal to [Pythagorean calculation] / [True distance]. The following plots show the relative error compared to the correct distance on the WGS 84 ellipsoid for latitudes from -70 to 0 in increments of 10 degrees. 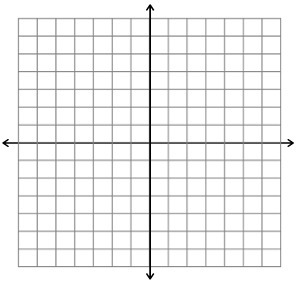 The horizontal coordinate is the difference in longitudes and the vertical coordinate is the latitude of the destination. Light regions have relatively small error: the contour lines are at 1, 1.01, 1.02, 1.05, 1.1, 1.2, 1.5, 2, etc. (The pure white areas in the corners are places where the error goes beyond the range of these contours.) The red dots show the point of origin. The vertical white bands testify to the correctness of expectation (1): Pythagorean distances are accurate when there is a small difference in longitudes. 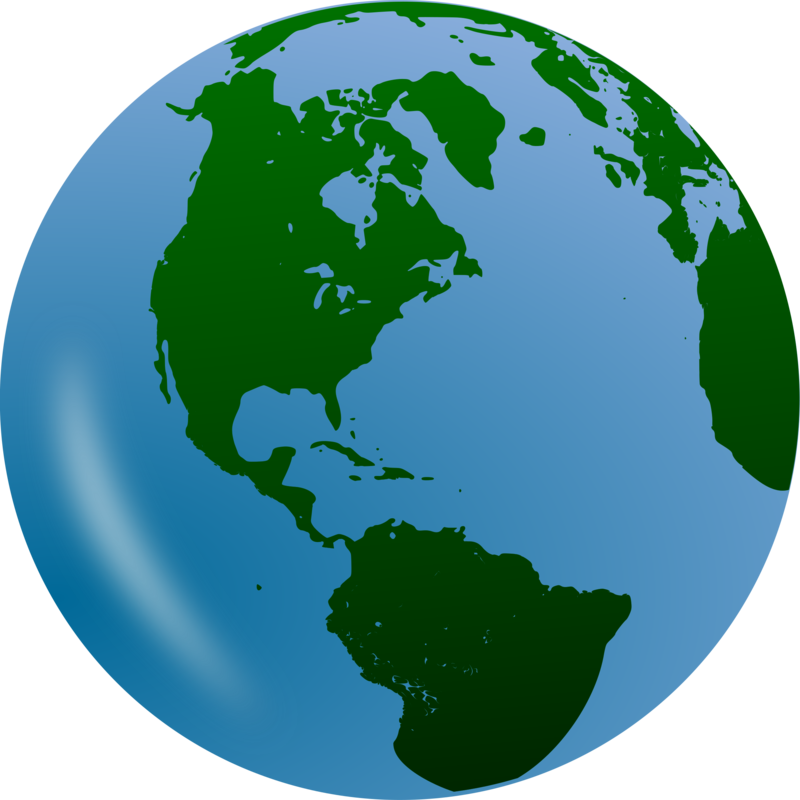 The horizontal white bands at low latitudes confirm expectation (2): near the Equator, horizontal distances are reasonably accurate. Otherwise, as witnessed by the extensive darker regions, at all other distances the Pythagorean formula is bad. We can make quantitative estimates of the maximum error attained for pairs of nearby points (within, say, a few hundred kilometers of each other). Scale--using an appropriate value for the radius--is true along the meridian but along a circle of latitude it errs approximately by the secant of the latitude. For example, at a latitude of 40 degrees the secant is 1.31, implying the Pythagorean formula will give distances about 31% too large in the east-west direction. (This is evident in the upper right contour plot, for a point of origin at -40 degrees latitude, where the region immediately east-west of the red dot lies between the 1.2 and 1.5 contours.) Short distances in all other directions will be too large by some amount between 0% and 31%; longer distances may err by even more (as the contour plots show). I interpreted "Pythagonean distance" as "Euclidean distance". Then the answer is the same as "what is the difference between the length of a chord of a circle and the subtended perimeter?" Let radius be R, subtended angle is A (radians). For a full and rigorous answer look to whuber's answer above. I'm going to answer in a more visual and basic way. The reason why planar/Pythagorean calculations are inappropriate is because the calculations rely on the fact that moving one step in any direction is a constant change in magnitude regardless of where you are on the graph. Longitude doesn't conform to this requirement. Lines of longitude converge at the poles. That is why when we flatten the Earth to reflect the rules of a planar graph we get distortion. If you look at that map it appears as if Greenland is roughly the size of Africa and Antarctica is about the size of Eurasia. Of course that isn't true. 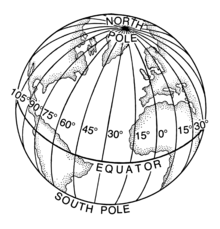 Greenland and Antarctica are both extremely distorted because they're close to the poles where longitude converges. 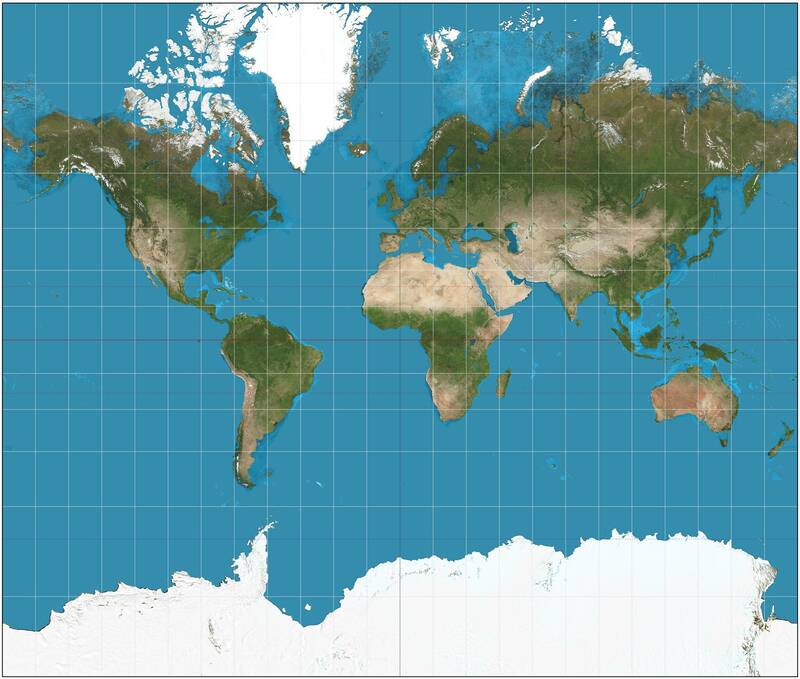 As you can see Greenland is approximately the size of Mexico. And Antarctica is about the size of southern Africa (not South Africa). As you can see the errors you'll get applying Pythagorean formulas depend more on where the points are than the distance between the points. With the important caveat that longer distances will magnify any errors. This is why planar solutions, while tempting, are a poor choice. Distortions will bite you and it isn't as simple as an offset. The errors are a result of warping the earth to fit inappropriate rules. Not the answer you're looking for? Browse other questions tagged coordinate-system distance spherical-geometry gis-principle haversine or ask your own question. How big does a circular geofence need to be for the curvature of the earth to matter? Algorithm to find N nearest points to point? Correct coordinate systems, but trustworthy distance between points? Getting H2GIS functions to work in Spherical Space? What kind of margin of error can I expect in figuring distance?